Leegleri is an US brand,focus on supply high quality party decoration and festival decoration products.Customer's satisfaction is the most important purpose for us. Run your fingers across the sequin, you can get a different color mermaid ,Just like magic,on the back we use double pure cotton cover zip closure ,make sue zip is durable and feel comfortable . These reversible sequins pillow case perfect for enjoying your free time,watching TV or taking a nap in sofa,decorations for your room, cars and chairs,also good choice as gift. reversible sequins touch feels like buttery soft, vibrant colors and flip over smoothly,The point is compare to other seller our Sequins are not falling off. We are so certain that unicorn reversible sequins pillow case will make your enjoying your free time that we offer a 30 day no-questions-asked refund policy. Buy from us with ease, confidence and no hassle return!! 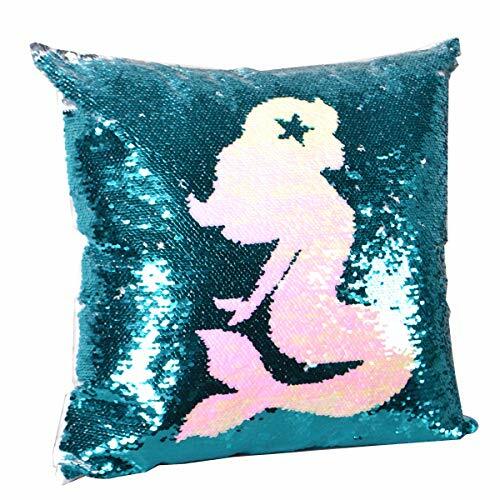 Size: mermaid reversible sequins pillow case size is 16" X 16"(40cm X 40cm), Recommend applicable to 17.7"x17.7"(45cmX 45cm )pillow insert,Insert not included. Highlights:reversible sequins touch feels like buttery soft, vibrant colors and flip over smoothly,The point is compare to other seller our Sequins are not falling off . Design: Run your fingers across the sequin, you can get a different color mermaid,Just like magic,on the back we use double pure cotton cover zip closure ,make sue zip is durable and feel comfortable. These reversible sequins pillow case perfect for enjoying your free time,watching TV or taking a nap in sofa,decorations for your room, cars and chairs,also good choice as gift,Warm tips: Hand wash please. If you have any questions about this product by Leegleri, contact us by completing and submitting the form below. If you are looking for a specif part number, please include it with your message. Set of 4 Pillow Covers Stripe Pattern Throw Pillow Case Daily Decorations Sofa Throw Pillow Case Cushion Covers Zippered Pillowcase 18" x 18"